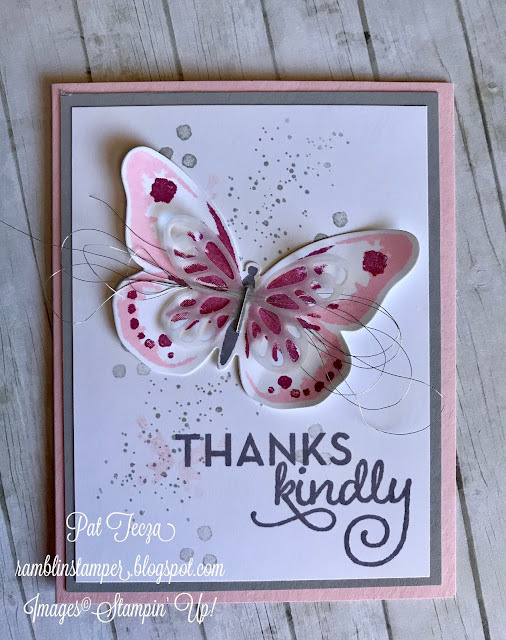 A little bit about how I stamped the butterfly...on a piece of Whisper White cardstock, I stamped the first layer in Pink Pirouette. Then I stamped the second layer in Sweet Sugarplum. I cut it out with the Bold Butterfly framelits BEFORE stamping the body in Basic Gray. Trust me, this is the best way to get proper placement on the body. Unless, of course, you have a Stamparatus, then lining up things like this is a breeze! Take a piece of Silver Metallic Thread and wrap it around the palm of your hand about 5 times - slide it off and twist it in the middle (it will look sort of like a figure 8). Lay it on top of your butterfly, cover it with a smaller butterfly that you've cut from vellum, and place a staple right down the center of the body to anchor it all together. I used my trusty Swingline desktop stapler for this step. Lastly, give the edges of the wings a little "lift" by gently curling them around a pencil or the edge of your bone folder. The card base is Pink Pirouette & the gray layer is Smoky Slate. I used the dotty stamp from Waterfront for the background. The grouping of 3 larger dots is included in Watercolor Wings, as is the faint little butterfly image you can see to the left of "thanks". Secondly, all of the current bundles are on the list. Some of the individual components will be available in the new catalog, but they will no longer be available in a bundle at 10% savings. So check your wish list for bundles and save some dough now! Lastly, due to high demand for retiring stamp sets, retiring stamp sets are guaranteed available until May 25; everything else is available only as long as supplies last. So if you need to prioritize your purchases or place more than one order this month, concentrate on papers, dies & accessories and make your stamp purchases in May. Whatever you choose, enjoy it and have fun with it! Everyone has their own ideas and their own style of crafting. I love giving the same materials to a group and seeing all the different ways they come up with to use them!